My big girl has just turned 6. Being 6 years old is an important milestone in our neck of the woods. Children start school at 6 in Germany. Before 6, the focus is very much on play. Children who have their sixth birthday before October 15th can start school in September. Others will have to wait another year (by which they will be almost 7) unless parents request early enrolment. Starting school is a big deal but not in a serious way. Families hold parties and celebrate the beginning of school as a big and fun family event. Schools welcome new pupils with little ceremonies for the whole family too. I am told the first year is still pretty relaxed though: plenty of colouring and play time. In France, where I am from, 6 is also important because children move on to the 'big school'. This is where mandatory schooling starts (even though the vast majority of kids now attend school from 3). Primary school is all about writing and reading for the first year. In the U.K., 6 is not so much a milestone as school starts earlier (at 5 years old). Typically, around 6, children can ride a bike, ask for the meaning of words, write their own name and generally refine many skills. 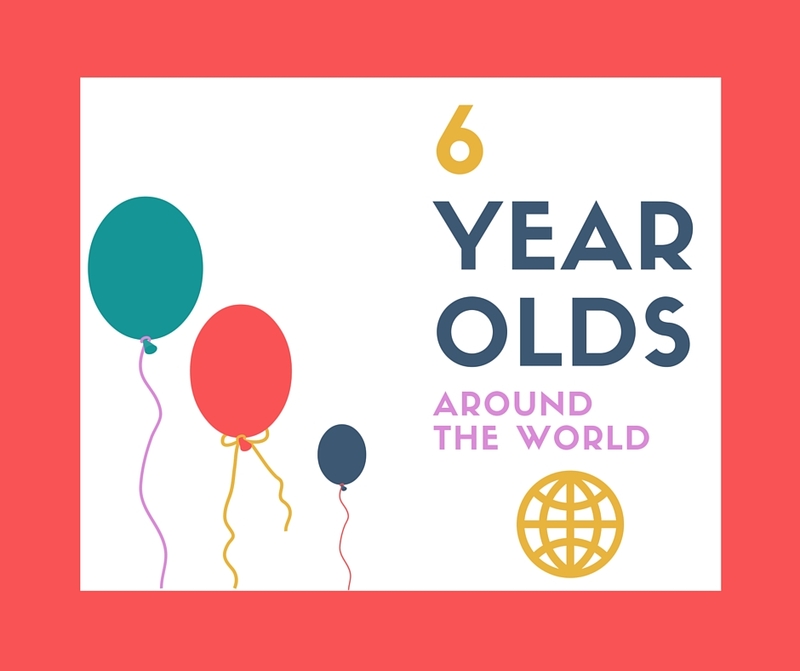 In this little series, I will introduce to you children from around the world who are in the year of their 6th birthday. Either they have just celebrated it or will do so in a few weeks/months. My aim is NOT to judge any of them, nor to pitch them against one another. I just want to show how fabulous it is to be 6 years old in the world today. Without further ado, here are our first 6-year-olds (including mine). Leanna adds about her son and the school system: "School here starts at 5. You have to have turned 5 by a certain date to start with that class. They have moved that date back for several years, so that now I believe you have to be 5 by August to start school that fall. If you miss that cut off, you can do "TK" instead (Transitional Kindergarten), a sort of prep program (not required) in between preschool and kindergarten. My son missed the cut off for that also, as his birthday is so late in the year (December). That is part of why we started home schooling, since to me he seemed too mature for preschool but not eligible for kindergarten or even TK." Ann writes about her son at school: "He started at a KiTa (Kindergarten) when we were in Germany and he was 3. He went 6 hours a day there and the focus was more on play. I'm not sure what the norm is. I know for the school he's currently at it's a lot more arts focused than other preschools in the area or others I've heard about in the U.S. He has multiple teachers that are specialists in their area (ie. the Drama teacher has a degree in Drama...). He loves it. He loves being able to do all these different activities every week." Souad writes about school: "We've now had the experience of education in both the UK and Switzerland. They are quite different. In the UK, A would have started school last September. She would be attending Reception class 31.25 hours a week, wearing a uniform, and either having a packed lunch or a school dinner. Here in Switzerland, Kindergarten lasts 2 years, meaning A will only start formal education aged nearly 7." The cut off date for children starting school in our region of Germany is 15 October. Any children in the year of their 6th birthday can start then. If they are born after that date, they will have to wait until the following year, making them almost 7 by the time they start. Some parents appeal that and do manage to get a place anyway but this is how the system normally works. Take a look at part 2 to discover more fabulous 6-year-olds.